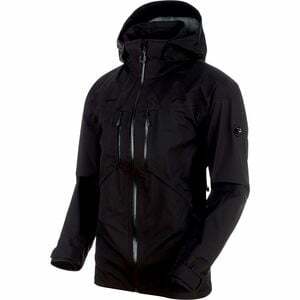 The Mammut Stoney HS Jacket is a versatile shell jacket that transitions from the backcountry to the resort with ease. Its waterproof and breathable DryTech membrane and fully taped seams keep you dry when it's dumping on long lift rides and face-shot filled powder runs. A three-layer construction makes the Stoney thinner, more breathable, and longer-lasting compared to two-layer shells, making it ideal for touring and high-output terrain. Mammut also equipped the Stoney with zippers under each arm for ventilated airflow, and both the hood and powder skirt are removable for customized coverage in snowy or sunny conditions. For added comfort and coverage you have Lycra thumbhole wrist gaiters, and to make zipper adjustment easy with gloves on there's a large U-shaped main zipper pull. Pockets on the inside and out give you storage for maps, goggles, and snacks, and a special internal media pocket allows you to thread headphones through and jam out while you ride. QUESTION: Hi, is there any insulation in this jacket, perhaps similar to the Mammut Cruise jacket? ANSWER: This is just a shell with no insulation in it.